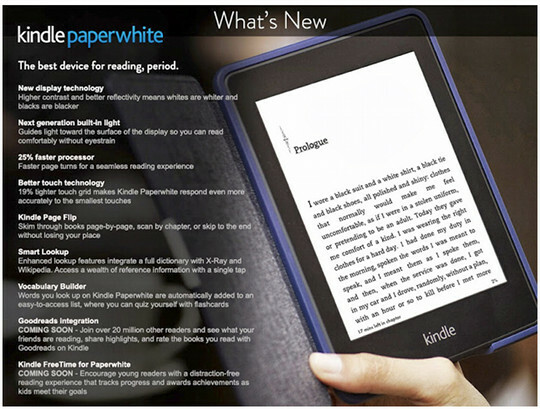 Earlier today Amazon slipped up and accidentally started displaying the new product listing page for the 2nd generation Kindle Paperwhite. They have since taken the product listing page down (it’s back; in fact I just pre-ordered one), but not before someone snapped some screenshots listing the new features. The Kindle Paperwhite 2 appears to be an incremental update. Not much has changed and the overall design looks identical to last year’s model. The price starts at $119 like last year, and the new Paperwhites are expected to start shipping on September 30th. Amazon describes the new Paperwhite as having a higher contrast screen with better reflectivity, a processor 25% faster, better touchscreen responsiveness, and a next-gen light. It also has a feature called “Kindle Page Flip” that sounds like a fast page-turning option for scanning pages quickly (like other ereaders have). There’s now “Smart Lookup”, which sounds like it integrates Wikipedia and X-Ray for more detailed information with a single tap. Another new software feature is “Vocabulary Builder”, which basically adds words you’ve looked up to a list for reference. Goodreads integration and Kindle FreeTime are listed as feature that are “Coming Soon”. Adding Goodreads is no surprise since Amazon purchased Goodreads a few months ago. Kindle FreeTime tracks reading progress and awards achievements for reading goals (it is designed to keep kids interested and motivated). The exact numbers aren’t shown anywhere but it sounds like the new Paperwhite is going to have the same 6-inch 1024 x 758 resolution E Ink screen as the last model. Amazon uses the words “higher contrast” and “better reflectivity”. There’s no mention of higher resolution. Instead they made the background whiter and the text darker. And of course there’s the next generation built-in frontlight. It will be interesting to see how the screen compares to the original Paperwhite. I hope Amazon managed to work out all the issues with uneven lighting and discoloration. 6″ E Ink screen with 16-level gray scale and exclusive “Opal Technology” (whatever that is; could it be E Ink’s new screen tech?) Edit: This is really weird, but at some point during the day Amazon changed the description page from saying “Opal Technology” to “Carta e-paper technology”. Update #2: Amazon has now officially announced the All-New Kindle Paperwhite—The 6th Generation of Kindle. Nathan, do you think the screen is coming from another source other than e-ink? Maybe Amazon themselves. Didn’t they acquire a screen technology company a while back? It’s the next gen E Ink screen most likely. The company Amazon bought, Liquavista, is color screen tech.